Are you confused which one to choose between Looker and Tableau? These two products are among the most popular business intelligence software solutions in the market. With both having its own pros and cons, we prepared this article for a Looker and Tableau comparison to help you determine which one suits your business needs best. According to Dresner Advisory Service’s 2018 Wisdom of Crowds® Business Intelligence Market Study, 2018 saw small businesses with around 100 employees to have the highest BI adoption rate. Meanwhile, BI’s most crucial initiatives and technologies involved data warehousing, advanced visualization, end-user self-service, reporting, and dashboards. For 2019, the top business intelligence trends include data discovery and visualization, self-service BI, MD/DQ management, data governance, and a data-driven culture, as per BARC’s BI Trend Monitor 2019. Analytics is one of the cornerstones of business intelligence. 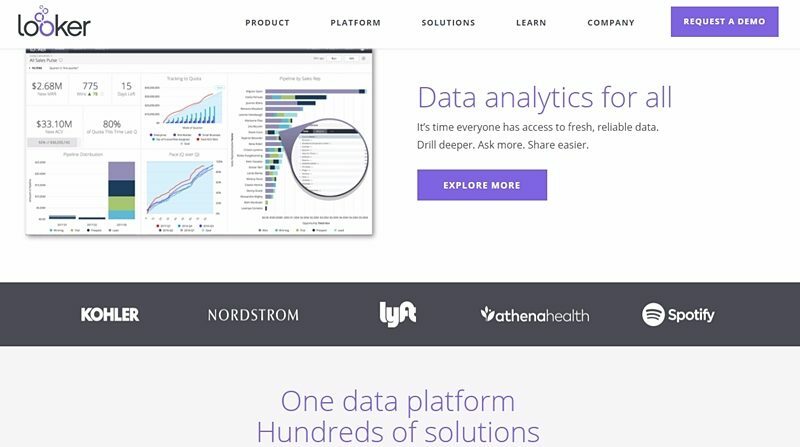 Current BI platforms and solutions integrate three of the most important components of business intelligence – data analytics, data reporting, and data visualization. All these are meant to extract useful information and relevant insights to guide business leaders and key people in the organization when it comes to crucial decision making, which is what BI is all about. There are several BI software in the market today, all, of course, are being advertised by their vendors as the best. You, as the smart business leader or professional, surely won’t take anything hook line and sinker. You have many sources where you can collect software information – customer/user feedback, expert reviews, demos and free trials offered by vendors, and video tutorials, among others. We at FinancesOnline have made it our mission to help you narrow down your choices, giving you the results of our analysis on software features, benefits and pricing. In addition, we give you a wealth of software information: top 10 listings (according to our review score and user satisfaction rating), top alternatives, and useful comparisons. For business intelligence software, we provide you this head-to-head of two of the leading BI solutions we have reviewed. As always, we are here to help you make intelligent decisions. Looker currently holds a high place in our most popular business intelligence software products. It is the preferred BI platform of over 700 companies worldwide on the strength of its robust features including its noted data exploration capability. It has an easy-to-use, web-based interface where you can quickly build and share reports, and build your own analytic modules with a bit of Structured Query Language (SQL) knowledge. Marketing – dig deep to find what you need to drive leads and improve conversion rates. Sales – get reports, dashboards and data to help sales teams perform more effectively. Account Management – securely centralize all data for deeper understanding of everything related to customers and accounts. Operations and Processes – see the whole picture, from workflows to inventory to process management. Support – give support teams access to secure, complex analysis so they can give efficient support and resolve issues effectively. Product – design and develop better products with clearer insights based on customer tastes and behavior. Web Analytics – map user interactions on your website so you can optimize it and drive results. These and many more functionality are explored in the features comparison below. Tableau is a self-service analytics solution that helps companies visualize and understand their data. The solution allows businesses to quickly connect, visualize, as well as share data through its many features. It allows you to connect to a number of data sources you’re already using, import and visualize data in a matter of minutes. It works fast and flawlessly from data saving, sorting and sharing to moving data, building and publishing a dashboard. Its comprehensive library of data visualizations help quickly create stunning charts and graphics. Some of the most useful components of Tableau are detailed in this article. IT – facilitate day-to-day infrastructure monitoring, helpdesk management, and budget planning. Sales Analytics – understand sales numbers and how to make them grow. Social Media – get in-depth social media performance across all platforms and sites. Finance – bridge financial and business data lines to strengthen strategy. HR – visualize relationships between productivity, hours, and tasks to optimize schedules and resources. Some of the most useful components of Tableau are detailed in the comparison below. A business intelligence platform is made up of many different tools and functionalities, often integrated into one package. But there are many common features among BI solutions. Let’s see how our two leading contenders stack up on basic BI features. The heart of BI solutions is their analytical processing tools that undertake the important legwork of data preparation, processing, and delivering information. Analytics helps dissect, filter and consolidate disparate data sets to come up with interpretable data. Looker specializes in data discovery and utilizes a simple yet robust data modeling language called LookML to power data exploration. A single IT specialist is all it takes to define and correlate business metrics and the modeling tool will write the right SQL to answer any data explorer’s queries. Tableau easily loads and extracts data through its many connectors that can link to a number of data sources. It can do data preparation and manipulation in a fast and straightforward manner, although these would require some extensive training for first time users. Reporting, as well as querying, relates to how complex data is sorted and generated. Integration functions are usually used to tap into external sources. Likewise, mobile access for query and reports leverages the flexibility afforded by cloud computing and real-time data. Looker offers standard reporting through pre-built report formatting templates, so users don’t have to create them, as well as ad-hoc reporting to enable users to build customs reports for specific requirements. Meanwhile, Tableau uses its fast authoring environment and extensive connectors to create and publish reports and dashboards in multiple output formats. The sum of BI analysis and reporting, it is the “end stage” and one of the most identifiable elements of BI solutions. Data visualization comes in many forms such as charts, graphs, infographics, dashboard widgets, geospatial reports, heat maps and funnels. Looker creates visualizations through its drag-and-drop function where you can put your desired elements, and assign roles such as Administrators, Users, and Developers. A mapping feature is also available for inexperienced users to prepare highly technical visualizations, and import or export those outside Looker’s dashboard. With Tableau, several types of visualization can be created via its ready-made templates and easy drag-and-drop feature. Data and information need to have ample security mechanisms and most BI software provide these. Looker has as a section in the admin panel that involves security settings such as two-factor authentication, Google and HDAP authentication, and HTML sanitization. On the other hand, Tableau can set security permissions at any level. This feature is normally included in BI solutions to facilitate group analytics and to make sure that individuals and teams are well coordinated when undertaking BI processes and tasks, wherever they maybe or whatever device they may use. As a web-based platform, Looker allows real-time data sharing and collaboration among users through any browser as well as on mobile device. Data and reports can be shared via email or URLs, or integrated into different applications like Excel, Google Docs, and even custom and third-party apps. Also, a Looker project can be saved as a Git project, allowing for users to track changes to their SQL code bases. Tableau has a public dashboard feature where users can access and process data, and even make comments. It also has a mobile app for different devices to allow sharing and collaboration, and the completion of tasks regardless of a user’s location. BI solutions harness different data sources to come up with meaningful insights, hence integration is important. Many BI tools can work with other platforms such as CRM, sales automation, and shopping cart apps. Others have API integration that allows developing apps for the software. Looker has an open API to integrate the platform with custom apps or third-party systems. The software has extensible features to make it work with other products and systems. One such feature is called “Blocks” that support integration with popular Web apps like Zendesk, Salesforce, Slack, Snowplow, and Amazon Athena. For Tableau, its app dashboards can be embedded in Confluence while the app itself can be an add-in for Excel for reshaping data, or used with Alteryx for visualizing data. Looker: It can be accessed by any browser on a web-connected mobile device. Tableau: Has a mobile web app that supports devices running on Android and iOS. Looker: Vendor provides email, phone, live chat, training and webinars. The product website has several sample data sets that can be accessed freely with a Looker account. There is also a discussion forum for many in-person tutorials. Tableau: Vendor offers online and phone support as well as knowledge base, forum and video tutorials. Looker: By subscription, ranging from $3,000 – $5,000 per month for 10 users, and $50 per month for additional user. For more pricing details, you can contact the vendor and ask for a quote. A free trial is available. Tableau: By subscription. Prices vary depending on version and deployment. Free trial is available.